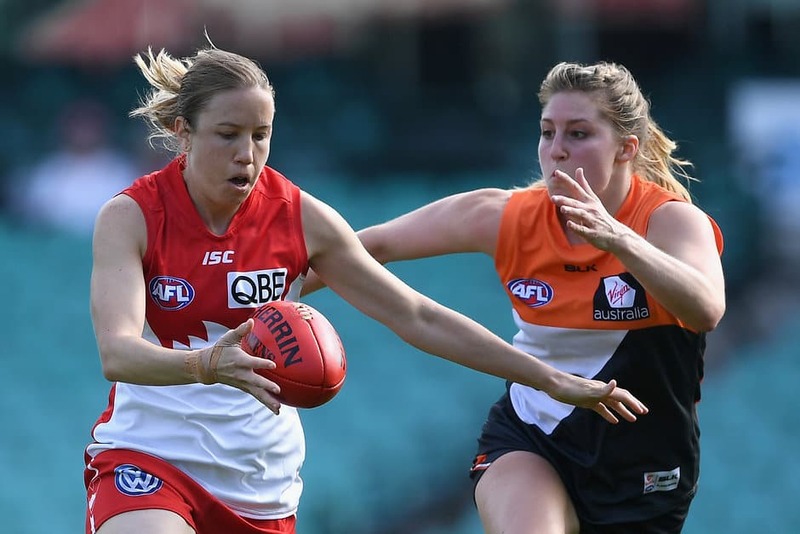 THE SYDNEY Swans comfortably accounted for cross-town rivals the GWS Giants in a women's exhibition match at the SCG on Saturday, winning by 29 points. Although both teams were able to get the ball inside their forward 50 zones consistently, it was the Swans who made the most of their opportunities, with excellent ball use and strong marking. In contrast, the Giants missed chances, their rushed delivery leading to a number of turnovers. They also had difficulty defending, especially when kicking out from goal. On three occasions a Giants defender kicked out straight to an opposition player, resulting in three goals for the winning side. Nicola Barr was outstanding for the Swans, collecting 16 kicks and sending the ball inside 50 five times. Fellow midfielders Monique Hollick (25 disposals) and Maddie Collier (14) provided class and displayed excellent decision-making skills throughout the match. American import Kim Hemenway top-scored with three goals. The 31-year-old, who flew into Sydney from the United States on Thursday, set up the Swans in the first quarter when she kicked two of the game's first three goals. Teammate Jacinda Barclay also played her role up forward, booting two goals. Although behind all day, the Giants battled courageously and managed to win the last quarter. Mai Nguyen collected 16 disposals and Lael Kassem provided pace and excitement through the midfield. Keeghan Tucker kicked two goals before being moved to full-back in the second half. Anne-Maree Ghirardello also kicked two goals, including a brilliant one from the forward pocket on an extremely tight angle. The SCG clash was the third of this year's 10-match women's exhibition series, with the Sydney encounter showcasing the best female talent in New South Wales and ACT and several American imports vying to be part of the AFL inaugural women's league starting next year. The game was played as a curtain-raiser to the Swans-Giants AFL match. A NSW/ACT representative team made up of players from Saturday's match will take on a South Australia team at Adelaide Oval on June 5.